Meinl has boosted its samba inventory with some highly innovative and above all easy to play variations on traditional Brazilian designs. Sturdy build quality and highly durable. Easy to play and affordable. Meinl offers staggering choices for drummers and percussionists and its attention to detail is highly lauded. Brazilian samba instruments are, by their nature, hugely diverse and traditionally have been produced from a great many materials. 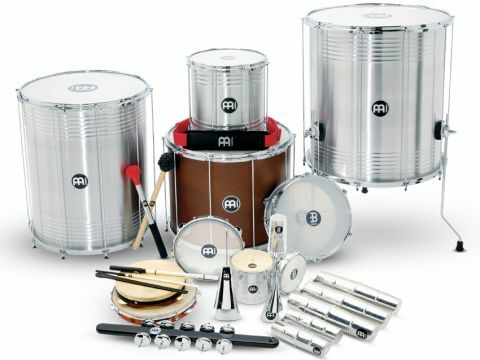 Meinl has taken into consideration just how tricky it can be when you play these instruments in a street situation (marching and dancing to the irresistible pulse of the samba) and has a full line on offer constructed almost entirely of extremely lightweight aluminium, but still boasting beautiful tones! The majority of these instruments are constructed from top grade lightweight aluminium, which makes them extremely easy to play for extended periods. "Meinl has taken into consideration just how tricky it can be when you play these instruments in a street situation and has a full line on offer constructed almost entirely of extremely lightweight aluminium"
The 22" stand-alone surdo is an impressive beast and comes complete with three chunky ﬂoor tom-style, height-adjustable legs. If you're looking for a gigantic sound and perform in a static situation then this is highly recommended. The 20" surdo, on the other hand, is designed to be played hanging from Meinl's adjustable, comfortably padded shoulder/hip belt and is again constructed from aluminium. The third surdo is an attractive but much shallower 20" diameter hardwood model, and all three come equipped with sets of highly durable synthetic heads. The 10 (non-intrusive) one-piece tension rods have countersunk bolt heads and tune up really easily with the included key. The 12"x12" repinique is made the same way as the surdos and comes with eight tension rods for exacting tuning of its pair of synthetic heads, and across the entire range Meinl has applied its logo underneath the heads to eliminate messy chipping of the design. The Brazilian snare drum (or caixa) that we were sent is Meinl's 'Traditional' 12"x6" model and comes with static guitar string snares. This caixa is the deepest model in the catalogue, has the same look as the previous aluminium instruments and will cut through any ensemble nicely. The three pandeiros all featured differing materials and were quite a revelation - not least Meinl's new lightweight rubberwood 'Shell-tuned' model, which has an ingenious hex screw tuning system at the bottom of the drum, hand-hammered brass jingles and an ergonomic design/feel that you'll not want to put down! Available in 10" or 12" sizes, it's a much more comfortable option for both novice and expert player alike. The other two pandeiros are a more traditionally designed rubberwood model (10" or 12") topped with a responsive goatskin head and a cool black 10" ABS plastic model with a synthetic head. We also received a 6" aluminium tambourim, a funky 6"x5 3/4" aluminium qweeka with a super resonant goatskin head and a selection of single, double and even triple aluminium Samba shakers! With small and medium A-Go-Go bells and a piercing Samba whistle rounding out the aluminium collection, Meinl also included its Wooden rocar (jingle stick) with no less than 20 pairs of solid jingles! The aluminium surdos have a controlled tone when played dead centre, but when played towards the rim have an almost timpani tone, which is a lovely contrast. They have bags of volume with the 20" being easy to carry using the comfy Samba belt, while the 20" wooden surdo was a warmer, more controlled option. Both the repinique and caixa could easily cut through a section of surdos and again their lightness made dancing around with the aid of the shoulder strap a pleasure! I loved the sound and the light feel of the 'Shell-tuned' pandeiro the best but I guess that the chestnut model is closest to traditional Brazilian designs. The ABS pandeiro was almost a middle ground between the other two and had a unique muted tone while being easy to play for extended periods. The same was true with the super-resonant 'Floatune' tambourim and indeed the superb silky-sounding shakers, while the rocar provides a myriad of jingle tones in an easy to play design. The A-Go-Go bells are pitched nicely, beautifully cutting and sound totally authentic whilst the qweeka (friction drum), although diminutive, was sensitive, loud and sang out over the ensemble drums.